Neil Smith - for his performance at the Full Tour of Pendle. PB by over 25 minutes compared to last year a result of his commitment to training over the last month or so. 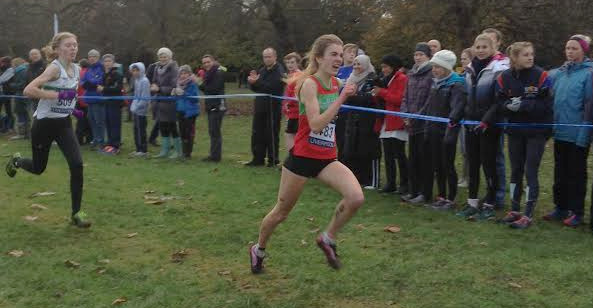 Sally Morley - Abbey Dash club record, sub 37, 2nd F40 & fastest IH ladies 10k this year. Also a great West Yorkshire Cross Country League, finishing top ten and winning the F40 category in each of her three races, 1st F40 in the League. From Adam ... I got a new PB on the Parkrun - 19:09. So actually slower that my 10k 5k pace! There was a strong headwind which made the cycling down (to the start) and running tough and I had had two Christmas meals on the days previous so probably slowed me down a bit. Hopefully I'll get sub 19 next week. For the seniors, this was the final counter in the XC/Trail section of the Ilkley Harriers Race League. Some excellent junior results too. Steve Turland was 2nd in 19:24 at this weekly 3 mile timed run at Danefield, 17 finished. From Georgia Malir ... on Saturday I competed in the second of The British Athletics Cross Challenge series. The race also incorporated the European Cross Country Championship trial. The field was stacked including the likes of Emelia Gorecka, who has been pretty much unbeatable throughout the whole of her running career. With only six places available on the GB team the race was bound to be a fight all the way to the line! With such a high standard of competition the plan was to sit in the front group and see how long I could hold on. Before long 4 athletes were out the front, leaving me and 5 other girls chasing them down. As I came into the finishing straight I heard the commentator announce that the fight was on for 5th place and the last automatic qualifying spot on the team! Unfortunately my legs couldn't carry me any faster and I crossed the line closely behind the girls I'd been running with throughout the race in 10th place, not with a GB vest but only a few seconds away! Oh well, I'd given it everything so maybe next year! Unsurprisingly Emelia Gorecka won the race in 14:27 and I was 10th in 15:10. Check out some of the footage from my race. Dan Wilkinson says ... it was freezing, Will Buckton and I played cat and mouse for the entire race, eventually, after he spent the middle half of the race in front I overtook him on the final descent and finished in 2:47, he was 2 mins behind, which was 17 minutes faster than his 2013 time! From John Hayes ... When I queued for my number in Barley village hall, the man in front of me took it. It turned out he was called Jonathan Haynes. He was looking doubtfully at the missing "athan" and "n" and was scratching his head why his club was shown as Ilkley Harrierrs. I pointed out that we shared similar names and grabbed my number from him. This near disaster averted I headed to the start line. 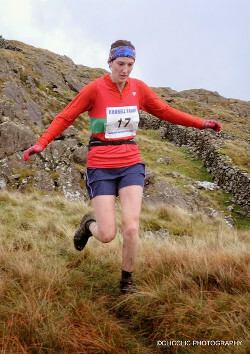 There I decided to try and keep pace with Kate Archer who had been my unofficial "pacemaker" for much of the Langdale Horseshoe. However, this plan went awry as she skipped away from me up the first hill. In her place I found Neil Smith to run with. I ran alongside him for a while attempting light-hearted chat. But Neil soon tired of my idle ramblings and he too sped off ahead of me. I then gave up trying to latch on to other Harriers and ran/stumbled/crawled around the rest of the course. 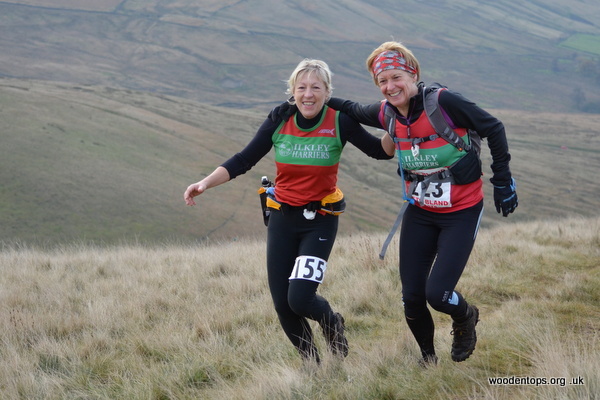 This race is the roller coaster of fell running - lots of steep ups and downs and it leaves you feeling a bit sick and dizzy at the end of it..... But fun nonetheless which is why we keep going back to it! 478 kids were running today! Results on the junior pages. From Henry Heavisides ... Conditions were near perfect for today's Abbey Dash in Leeds: dry, mild & virtually no wind. The start was bit chaotic, being changed from previous years to allow a record 12500 entries, the system of runners being in 'pens' based on anticipated times didn't seem to be particularly effective. 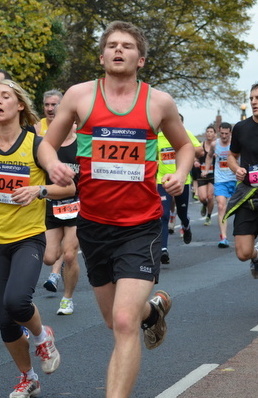 There were lots of Ilkley vests throughout the masses of runners. 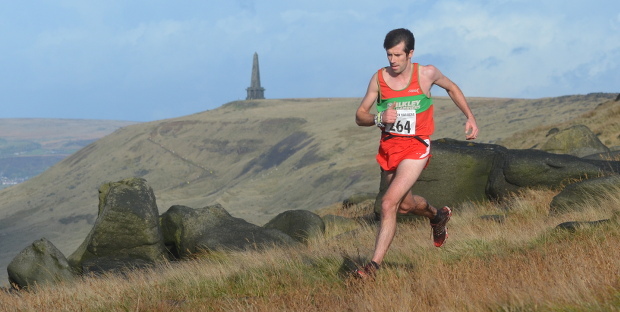 The results seem to miss the name of the club for several Ilkley Harriers, including (I think) our first 3 male finishers: Dan Wilkinson, Rob Cunningham & Ben Sheppard. 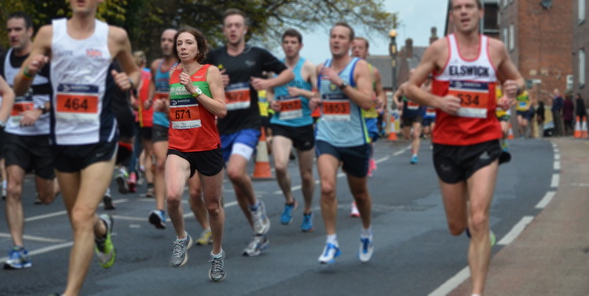 Sally Morley did a great run in the fastest IH ladies 10k time this year (setting a new Club F40 record, beating Beth Massey's 38:29 from last year's Dash) & finishing 2nd F40 in the race. Also in the prizes were Hilda Coulsey (2nd F60) & Henry Heavisides (2nd M55). 38 juniors raced, with superb individual and team results, more on the junior pages. For the 4th year in a row Tom Adams beat all runners, in his best time yet of 34:02, but this year he also beat all those on bikes! Dave Wiby was one of those cyclists, his placing affected by a puncture. No Rob Jebb (the 3 Peaks Cyclocross champion) this year, but could Tom beat even him (as Simon Bailey did in 2009?) 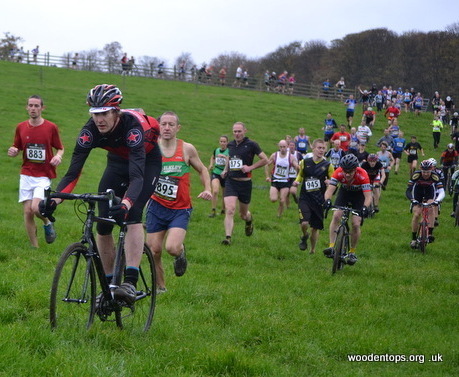 Have a look at the photos on Woodentops.org.uk and the cracking race video on Youtube. From Pete Shields ... Caz Farrow and Nicky Green ran in the Cote d Azur Marathon, a point to point route that took them from Nice to Cannes, west on the coast road. Caz and Nicky have really focused on this race and worked extremely hard over the last year in preparation, one period of their training included 90/100 miles per week. They were well prepared, however, you can be well prepared in this athletics game but there are other considerations that come into play one being the weather! The Riviera seems a safe bet to run a race so late in the year but unfortunately, not this one. We had followed the forecasts over the last week, the weather had been fairly settled other than race day, where high winds were forecast from the west, the race as previously stated was going west into it, its force gauged at 42/48 kph, not gusting just blowing! They both started the race with the other 13,000 competitors trying to keep as much to their race plans as possible, Nicky went through 10k in 41:51, half in 1:27.47 and 30k in 2:05:06 the wind started to make play at this point slowing her pace down by over a minute per Km, she even thought of running backwards at one point because of the difficulty the wind was having on her breathing, she wasn't joking! Her finishing time considering the conditions was 2:58:31 which got her 3rd female over 40 a PB by 10 secs and 120th place; we are left with what could have been. Caz went through the first 10 miles in 66 mins, a PB and part of her plan, through the half in 1:28, she then got a niggle in her hip at 26kms but kept pushing on, going through 20 miles in 2:14 another PB; unfortunately, a combination of the hip problem and even bigger problem of the wind ended her race shortly afterwards. This didn't come easy to such a hardy competitor but after some reflection she will be taking her place at the Elite start in London, health allowing. Again what could have been, such are the vagaries of our sport. Jamie Hutchinson reports ... a great event in Sherwood Pines Forest starting with a 5k run, followed by a two lap bike course covering 20k, before a final 3k run. A real sprint event where you go as hard as you can and hope you can hold on. I did it on a cross bike and finished in 1 hour 18 mins coming in 7th overall, 2nd in my category, out of 307 duathletes. Karl Webster won in 1 hour 16 mins. Many great junior Ilkley results too.